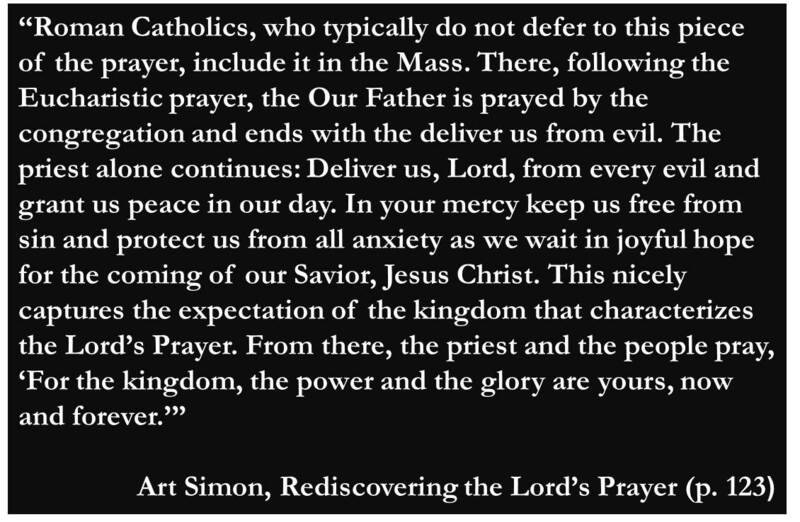 In referring back to the coming of our Lord and Savior Jesus Christ and His coming kingdom, Roman Catholics remind us that this is what the prayer is all about in the first place. It is all about what God is doing in the moment to bring about a future reality where our bodies are redeemed, our relationship with God and each other are reconciled and every other component of God’s creation – from the sun, the moon and the stars, to the earth, the land, and the sea, to the fish, the birds, and every other creature – are just the way He had always planned them to be. This is our hope, this is our eternity. Over the last few weeks of this series, one thing that I hope I have made consistently clear is that the Lord’s Prayer is a great model for crafting a biblically-based social justice theology. This prayer is important because it centers Jesus’ life, ministry, and purpose. It also gives prominence to the Kingdom of God, thereby giving us a glimpse of what justice looks like in light of the kingdom. Any social justice theology, or any theology for that matter, that neglects the kingdom is itself incomplete as it has the potential to place too much emphasis on the now and not enough emphasis on what is to come. The reality is that God’s kingdom is here among us now and is coming, too. What are we doing to bring others into it? How do our actions of love, justice, and hospitality, signal to the world around us that this Word we have been preaching for more than 2,000 years is real and should be taken seriously? We do it by acknowledging God as our Father. The creator of the universe belongs to each and every 7 billion of us, and we to him. Having this big picture view of God’s creation helps us to understand that everyone belongs to the human family, and that we have a responsibility to each and every member of this family. We do it by declaring God’s holiness throughout the earth. Worshipping God like this keeps us from exploiting others, and also gives us the ability to challenge systems of oppression that normalize injustice. We do it by proclaiming God’s present and coming kingdom and asking God for his will to be done in the context of His kingdom. Doing so helps us understand that we are not building our own kingdoms, but are invited to play a role in God’s kingdom – not a role where we dominate and rule over others, and not a role where we bully others into believing and thinking that way that we do. We do it by asking God simply for our daily bread. Asking God for only what we need and no more, is an act of rejecting, rejecting our tendency to hoard, to consume, to amass wealth and resources at the expense of others. We do it by petitioning for God’s forgiveness while we simultaneously offer it to others. Because we live in a moment of transition, in between the inauguration of God’s kingdom and the fullness of it, we will continue to betray God’s trust while those around us will betray ours – in spite of our best efforts to do otherwise. And when we do, we need to be forgiven and also offer forgiveness to others. We do it by asking God to deliver us from temptation and the devises of the evil one. While we have to be careful that we do not draw unnecessary attention to the enemy, we also cannot be ignorant of the devil’s schemes. His very nature is to steal, kill and destroy, and he accomplishes this goal by enticing people like you and me to play along. As we do these things, we tell ourselves and those around us, that we do not belong to the systems of this world. While others may get by mistreating and exploiting others, driven by pride, greed, and fear, we as a people of God, submit ourselves to a different standard. In doing so, we testify that we are not only living for the present but for the fulfillment of God’s kingdom in the near future. I believe that it is fitting to conclude this series reading and reciting the Lord’s prayer. In light of what we have explored, we now pray this prayer in a new way and are subsequently released into the world to live in a new way with God, self and others. For thine is the kingdom, and the power and the glory forever amen. Thanks for taking the time to read and follow this series on the Lord’s Prayer. Now is my time to hear from you! What do you think are the strengths of this series? The weaknesses? 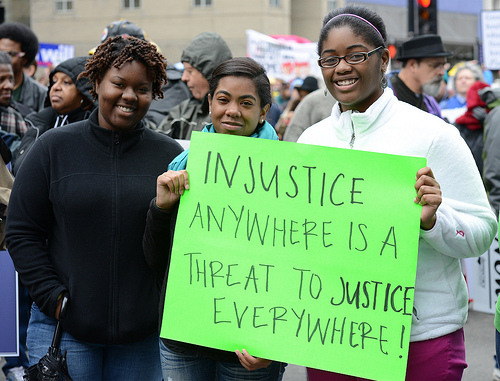 What other passages of scripture do you see either serving as a basis for or complement to a social justice theology. Leave your thoughts in the comments below!